The panelPopup component can be used to display various types of content inside a draggable or modal dialog. These dialogs can be used on pages to display important information and options to the user in a manner similar to a standalone offline application. The draggable popup panel can be moved around the page while still allowing interaction with the underlying page. The modal popup panel cannot be moved, and prevents page interaction by applying a partially transparent gray overlay. 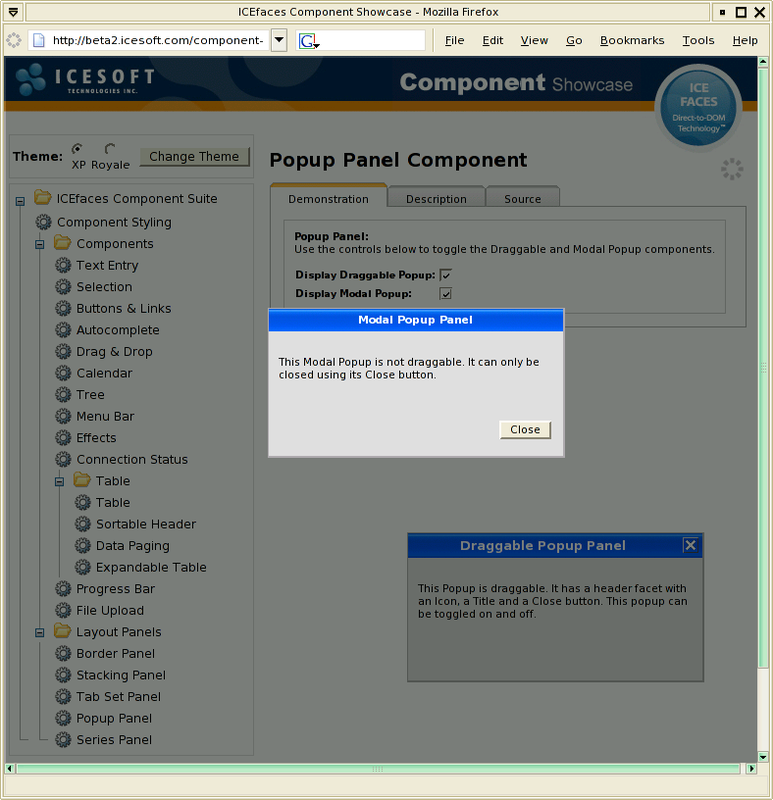 The following screenshot is of the ice:panelPopup component demo in component-showcase. Notice the draggable dialog covered by the modal popup. The panelPopup does not require any beans specific to the application. For example, static text can be used inside the body using only page level tools, which removes the complexity of bean setup. In the case of each example in this tutorial, a backing bean will only be used for the advanced demo. The creation of a draggable panelPopup is simple and does not require any backend code or beans. In this next example the page contains a single draggable panelPopup with 2 outputText components inside the body. 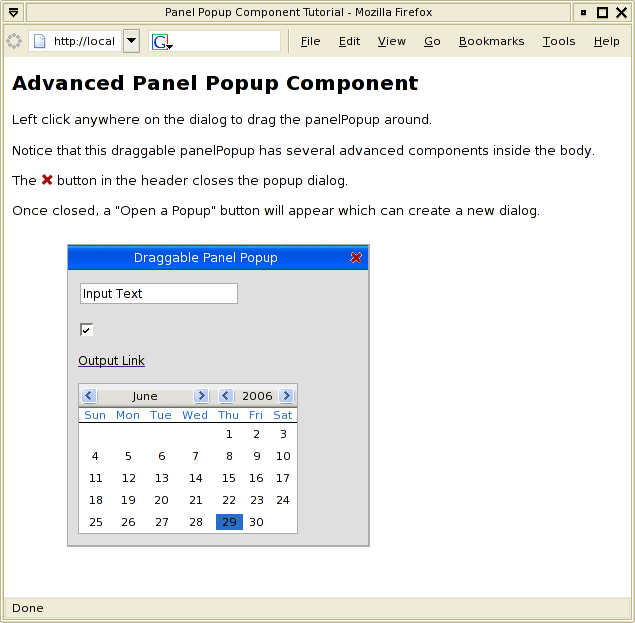 In this tutorial both facets contain outputText components, although it is possible to place other extended or custom components inside the popup panel. It is recommended that anything inside the facet be wrapped in either an ice:panelGroup or ice:panelGrid. The creation of this draggable dialog was very simple, as the draggablePanelPopup.jspx shows. Download the panelPopup-draggable source code here. 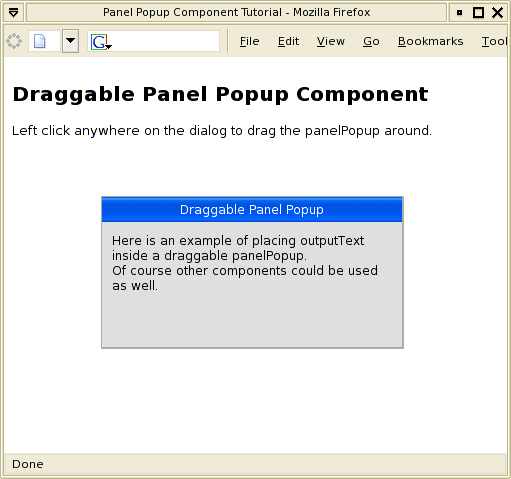 The modal panelPopup is implemented in a similar manner to the draggable version, as the next tutorial will demonstrate. Notice the blocking mechanism of the modal dialog, and also how the panelPopup cannot be dragged. 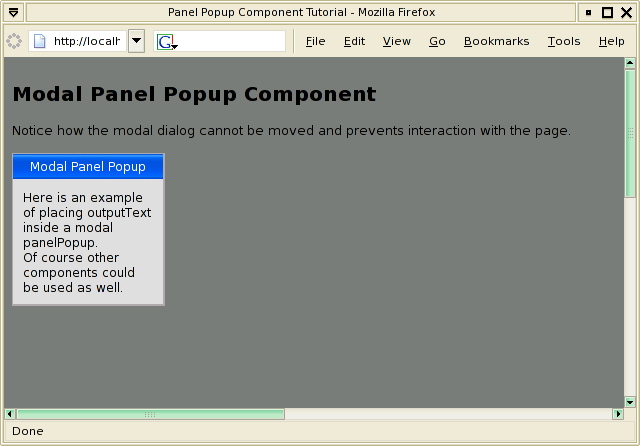 Download the panelPopup-modal source code here. The appearance of these 2 examples is rather generic and may not suit your application. The next section will demonstrate how to customize the CSS for panelPopup. Next the default panel styles should be copied into the override sheet. To find the default styles, look inside the CSS normally linked to, which is ./xmlhttp/css/xp/xp.css. Copy all tab related styles into a new sheet, in our case override.css. Other CSS changes were done to help display the possibilities, and since all the relevant classes are accessible the panelPopup style can be completely changed. Download the panelPopup-style source code here. As was mentioned earlier, complex components can be used inside of the panelPopup, and backing beans can be added to increase the functionality. The next tutorial will demonstrate both of these functions. This tutorial will focus on 2 features of panelPopup not previously covered. The first is the ability to have complex components inside the dialog, and the second is adding a backing bean and dynamic functionality. Placing a new component inside the panelPopup is done by adding their tags, as shown below. This section also demonstrates how to use backing beans with this component. As you can see from the screenshot, a close button (appears as ) has been added. This close button acts as a toggle to change the visibility of the panelPopup. Once this is done, a visible attribute is added to the panelPopup, which uses the backing bean value, as shown below. The backing bean methods for these buttons and visibility attribute must now be written. The code for this is simple; the open method would toggle the visibility to true, and the close method would set it to false. For completeness, this is demonstrated below. Download the panelPopup-advanced source code here. As you can see it is trivial to add complex components and dynamic functionality to a popup panel. Component Showcase Available in release bundles Panel Popup example which includes draggable and modal, as well as closing and opening a dialog. Presenter Available on the demo site A panelPopup is used to confirm a user who wishes to pass moderator status. panelPopup-draggable panelPopup-draggable source code Simple example of how to setup a basic draggable panelPopup component. panelPopup-modal panelPopup-modal source code Example showing the modal type of panelPopup and the difference between a draggable dialog. panelPopup-style panelPopup-style source code Demonstration of how easily and fully a panelPopup can be styled with custom CSS. panelPopup-advanced panelPopup-advanced source code This example shows how complex components can be used, and how to tie a backing bean to the panelPopup.